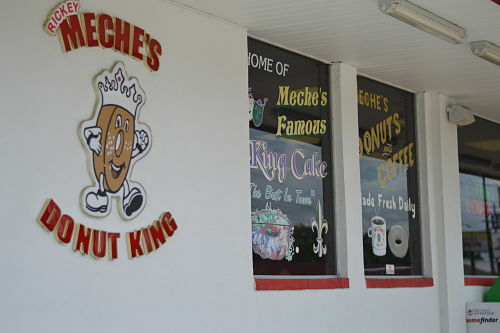 If you love donuts (and who doesn’t love donuts) – then you need to head to Meche’s in Lafayette. Trust me, they’re better than those KK doughnuts and galaxies better than the ones that supposedly “America runs on…”. Trust me on this, people – I have friends who have taken my taste test challenge and we’re all in agreement. Meche’s rules. My family’s obsession with Meche’s started when I was a kid, living in Washington. 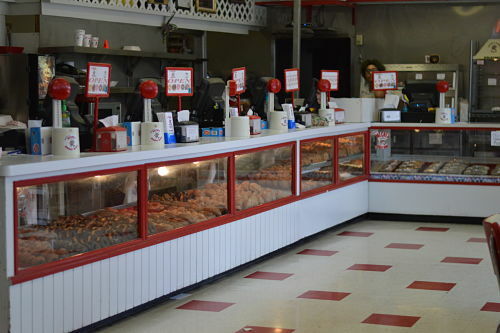 My father used to “motivate” us to get up for 7:30am mass by promising a Meche’s run to the location in Opelousas. It was always packed and I always ordered an eclair. Those were my favorite. A few years later, they opened various locations around Lafayette – there’s even one with a drive thru! These donuts are sent straight from sugary heaven and they’re best eaten hot and fresh with a HUGE glass of Borden’s milk or steaming cup of Community Coffee. 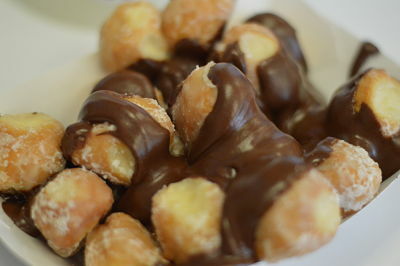 For an extra decadent treat, ask for your donut holes topped with chocolate sauce (my father started this when I was a teenager and I still think it’s the BEST). The eclairs are delicious as well and they are H U G E! You can choose from Bavarian creme filling or cream cheese filling – can’t decide, get one of each. These eclairs are so huge that they actually sell half sized ones. 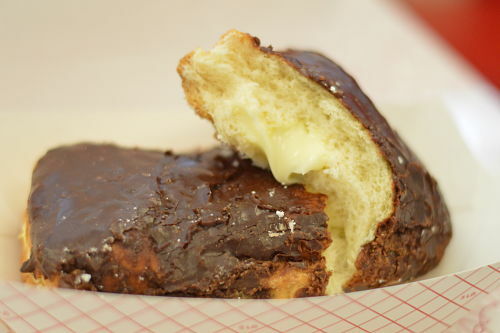 I prefer a half sized Bavarian creme filled eclair, which still leaves room in my belly for some donut holes. Yes, they make king cakes, too. The king cakes are basically a giant braided donut with cinnamon (think cinnamon twist) topped with more icing. It’s not a traditional king cake, but it’s delicious nonetheless. I’d like to give my sister in law, Jen B. Doucet total credit for the rockin’ photos. She did a fabulous job. Ordering up these tasty treats and photographing them is a tough job, but someone’s gotta do it…the bonus is you get to eat the tasty treats after you’re done with your photography. I’m sorry I couldn’t be there to partake.